India’s renewable energy growth plans will be most likely hindered by financing problems. Charith Konda makes the case for exploring alternative modes of financing for renewable power projects, by leveraging existing resources effectively. The government of India plans to more than double the renewable energy capacity installed in the country from 25 GW in 2012 to 55 GW by 2017 (The Hindu, 2013a). However, renewable energy is still approximately 52-129% more expensive than conventional power (CPI, 2014). In our previous work (CPI, 2012), we found that the biggest barrier to renewable energy in India is the inferior terms of debt – i.e., high cost, short tenor, and variable rate – which raises the cost of renewable energy in India by 24-32% compared with similar projects in the US. The main reasons for inferior terms of debt are general Indian financial market conditions of high inflation, an under-developed corporate bond market and competing investment needs. In addition, high cost of currency hedging negates the advantages that could come from access to lower cost foreign debt. Lack of availability of debt funds for renewable power projects, whether high cost or not, may also become an impediment in achieving the goals set by the government during the 12th Plan period (2012-17) and beyond. Based on the Planning Commission’s estimates of shortfall in overall infrastructure investment in the 12th Plan period (Planning Commission, 2011), we estimate a shortfall of approximately 45% of the required funds for solar and wind, amounting to Rs 101 billion and Rs 414 billion respectively. The Indian government has attempted to bridge this gap in infrastructure investment through a number of initiatives, such as Infrastructure Debt Funds (The Hindu, 2013b) and the National Clean Energy Fund (CleanTechnica, 2010). However, given the ambitious renewable energy targets and limited resource availability, there is a need to explore alternative modes of financing for renewable power projects, by leveraging existing resources effectively. Problems associated with financing renewables in India are the usual problems involved with financing infrastructure projects in developing countries and a number of instruments that have been used elsewhere have the potential to solve the main problems in financing renewables in India. 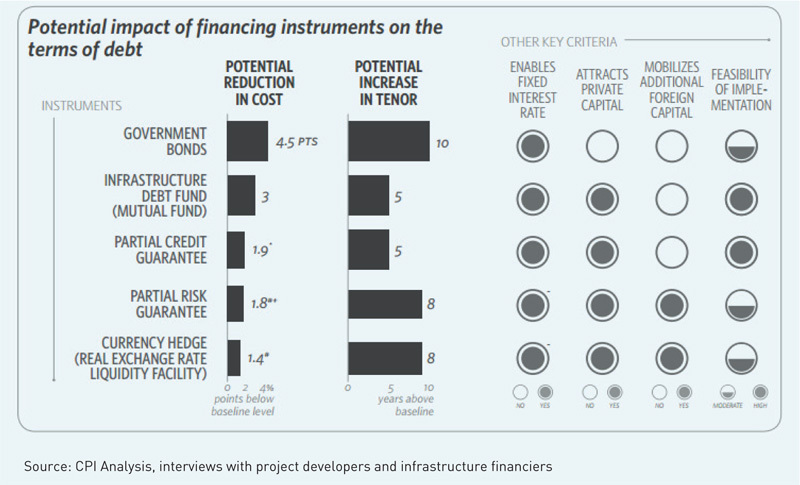 Globally, governments and multi-lateral lending agencies have tried various financial instruments to solve the problems related with financing infrastructure projects, including renewables. We examined a number of financial instruments that would: 1) provide additional funding from domestic capital markets; 2) help in accessing foreign funds; and 3) provide indirect support to projects by mitigating associated risks. We narrowed down to a few instruments for further study based on their potential to address India’s problems related to debt financing, namely – high cost of funds, short tenors, and lack of fixed cost financing. We estimated potential reduction in cost for each instrument from corresponding baselines, based on the nature and source of market debt (figure below). While exploring the benefit of an explicit government subsidy over and above the potential cost reduction through these instruments (CPI (2014), we also examined the implementation feasibility for each of the instruments recommended. The government can provide concessional finance to renewable power projects by raising money through the domestic issue of bonds and also by directly lending the proceeds to project developers. Since the government holds the highest credit rating in the domestic market, it can raise money at the lowest possible rate of interest. Based on maturity period, the yield on government securities varies between 7.6% and 8%, with the rate of borrowing for a 10-year bond pegged at 7.8%. The government can pass on the benefit of its ability to borrow at the lowest rate possible to the borrowers by lending at the same rate or at a minimum required margin. While a direct government borrowing and lending program can be designed in various ways, we explored three representative cases: 1) Lend at the government’s borrowing rate of 7.8% or lower; 2) Lend at the lowest possible commercial margin (i.e., 2 percentage points); and 3) Lend at the lowest possible sector-focused, government-owned financial institution margin (i.e., 3.4 percentage points). For the above three cases, compared with the median lending rate of 12.3% for renewable power projects in India, the expected reduction in cost of debt is 4.5, 2.5, and 1.1 percentage points respectively. This type of program could also extend the tenor of debt to the maximum possible for a renewable energy project developer, for example to the lifetime of the project i.e., 20 years; as the government has the ability to borrow for periods up to even 30 years. Our cash flow models (CPI, 2014) indicate that a reduction in the cost of debt by 4.5 percentage points and increase in tenor of debt by 10 years would decrease the delivered (or levelised) cost of renewable energy by approximately 25% compared to the case where projects rely on commercial loans. While the benefits are substantial, the government should design this program keeping in mind various checks and balances, for example, to support a specific renewable energy technology for a limited period, or in the case of a pre-determined capacity installation, to avoid crowding out of private investment. In 2011-12, the government of India set up the Infrastructure Debt Fund (IDF) framework to provide low-cost, long-term funds for infrastructure development. Although an IDF can be set up under two models – a Mutual Fund (MF) or a Non-Banking Financial Company (NBFC), we focused on the MF model only, given that the current design of the NBFC model is not compatible with India’s power project development. An IDF-MF functions like a typical mutual fund, which issues units to raise money and invests the proceeds in debt for companies and projects, with an exclusive focus on the infrastructure sector. An IDF-MF diversifies the risk of investing in infrastructure since the units derive their value from a pooling of cash flows. Investors may also find more liquidity in these units as they are traded on the stock exchange. IDF-MFs could bring more liquidity and expand the corporate bond market in India provided the government addresses some of the structural problems of the bond market. For example, the government should relax regulatory restrictions on institutional investors for investments in bonds and streamline bond issuance processes to reduce the costs and time taken for issuing bonds. A large and liquid corporate bond market could enable project developers to raise money directly through the issue of bonds, saving the cost of financial intermediation. A well-developed bond market would also allow project developers to increase their debt tenor to 15 years from the current domestic loan tenor of 10 years. As there are no examples of renewable project developers issuing bonds in India, the potential cost savings could be estimated from a recent AAA rated bond issue by a conventional power company, the National Thermal Power Corporation (NTPC). NTPC issued a 10-year corporate bond with a coupon rate of approximately 9.3% in 2012 (NSE, 2013). This indicates that, while domestic loans are available around 12.3%, project developers could issue bonds anywhere between 9.3% and 12.3%, with a possible saving of up to 3 percentage points. Using our cash flow models (CPI, 2014), we found that lowering the cost of debt by 3 percentage points and increasing the tenor by 5 years would reduce the delivered cost of renewable energy by approximately 14.5%, compared to the case where projects rely on commercial loans. The main reasons for inferior terms of debt are general Indian financial market conditions of high inflation, an under-developed corporate bond market and competing investment needs. In addition, high cost of currency hedging negates the advantages that could come from access to lower cost foreign debt. Partial credit guarantees reduce the cost of debt by enhancing the credit rating of a project bond. Higher credit ratings lead to lower risk premium and hence lower cost of debt; for example, the cost of borrowing for a bond with AA rating is up to 3.48 percentage points lower than a bond with BBB rating. The guarantor agency (usually a multilateral agency or a private financial institution) leverages its higher credit rating to reduce the risk associated with the project by guaranteeing a specific proportion of the borrowing. While the guarantee fee depends on the source rating of the bond, we estimated the cost of credit enhancement for various cases depending on the existing credit guarantee schemes of Asian Development Bank (ADB) and International Finance Corporation (IFC). We expect the net reduction in the cost of debt through a partial credit guarantee to be in the range of 1.4 to 1.9 percentage points. The benefit is highest (i.e., 1.9 percentage points) in the case of credit enhancement from A to AA. If project bonds with lower credit ratings are enhanced to AA, projects can tap additional funds from insurance and pension funds. Pension and insurance funds have longer investment cycles of 10-15 years, compared to 7-10 year loans offered by commercial banks (Business Line, 2013a). However, Indian regulations permit long-term investors such as pension and insurance funds to invest in corporate bonds only if they have a minimum credit rating of AA from at least two rating agencies (DIPP, GoI, 2012). Also, raising debt from the corporate bond market could extend the tenor by 5 years compared with the typical loan tenors available through commercial banks. Our cash flow models (CPI, 2014) indicate that reducing the cost of debt by 1.9 percentage points and increasing the tenor by 5 years would reduce the delivered cost of renewable energy by approximately 10.5%, compared with the case in which the projects raise funds at a cost equivalent to a typical A rated bond. In India, the institutional framework for offering such guarantees is already available from India Infrastructure Finance Company Ltd (IIFCL), which in collaboration with ADB provides counter guarantees (Business Line, 2013b). However, partial credit guarantees require coordination among the lender, the multilateral agency, the project developer and the guarantor, which can be complex to manage. We recommend further analysis on the design aspects of partial credit guarantees, such as the nature of coverage and risk sharing among stakeholders. While partial credit guarantees cover defaults arising from all risks subject to a pre-determined maximum amount, partial risk guarantees cover all defaults arising from a specific risk. Partial risk guarantees typically attract foreign funds by mitigating political risks such as breach of contract by the state, expropriation and currency inconvertibility; thereby reducing the cost of financing (ADB, 2013). A partial risk guarantee typically covers the entire debt amount as well as interest payments. Based on the World Bank’s fee structure for a partial risk guarantee, with a 10-year tenor, the cost of the guarantee as a proportion of total financing cost is estimated to be 0.4%. The net reduction in the cost of debt depends on the structure of the guarantee and the extent of risk coverage. For example, the cost of foreign debt for renewable energy in India is approximately 13%, which includes a premium of 2.2% for liquidity, volatility and political risk. For the purpose of illustration, let us optimistically assume that this entire risk is covered by a partial risk guarantee. Accounting for a guarantee fee of 0.4%, an upper bound on the cost reduction would be up to 1.8 percentage points. By facilitating the mobilisation of private foreign capital, partial risk guarantees provide access to longer tenor financing (Ferrey et al., 2006). The instrument would most likely extend the tenor up to 18 years from the usual 10 years as it reduces the risk involved for foreign lenders. Our cash flow models (CPI, 2014) indicate that reducing the cost of debt by 1.8 percentage points and increasing the tenor by 8 years would decrease the delivered cost of renewable energy by approximately 12.7%, compared to projects that rely on commercial loans. India has the necessary infrastructure and conducive regulatory framework for offering such a risk guarantee mechanism (Panchabuta, 2012). Furthermore, the effectiveness of the guarantee is not heavily dependent on the corporate bond market and the upfront investment is low compared to direct lending by the government. One of the drawbacks of a partial risk guarantee is the sovereign counter-guarantee requirement: multilateral agencies such as the World Bank provide partial risk guarantees only if the national government agrees to provide a counter-guarantee for any possible withdrawals from the guarantee amount. This has led to low up-take across the world due to complex stakeholder interactions under such an arrangement (CPI, 2013). Since the government holds the highest credit rating in the domestic market, it can raise money at the lowest possible rate of interest. Based on maturity period, the yield on government securities varies between 7.6% and 8%, with the rate of borrowing for a 10-year bond pegged at 7.8%. Foreign debt, due to lower interest rates in developed markets, provides a cheaper financing option for infrastructure projects, including renewables. Although foreign funds are available to Indian project developers at lower rates than domestic debt, the high costs of hedging associated with lack of liquidity and depth of derivative markets often neutralise the benefits of low-cost foreign funds. While a typical foreign loan is available to an Indian project developer at a rate of London Interbank Offered Rate (LIBOR) + 300 basis points which amounts to approximately 3.4 percentage points, a 100% hedge on the loan adds approximately 7 percentage points to the debt cost (Capital Mind, 2013). At present, the all-in cost of a foreign loan is around 13%, which is almost equivalent to the domestic loans that are available in the range of 12-13% (Morgan Stanley, 2012). Although there are various ways that the central government can lower the cost of currency hedging, we explore the exchange rate liquidity facility in more detail as other instruments, such as a government-managed fixed nominal exchange rate and foreign exchange-indexed tariff have comparatively more challenges in implementation. An exchange rate liquidity facility would act like a standby credit line to mitigate currency depreciation risk for a foreign loan borrower. The borrower could draw down funds from the facility when the domestic currency depreciates and the project’s cash flows available for debt service (converted into US $) go below a pre-determined floor value. The facility can be structured on similar lines as the Overseas Private Investment Corporation’s (OPIC) and Sovereign Risk Insurance’s Real Exchange Rate Liquidity Facility (Matsukawa T., et al., 2003). Similar to OPIC’s facility, electricity tariffs should be adjusted for inflation periodically, thus reducing the nominal exchange rate risk problem to managing the real exchange rate risk. In the interim, if there are adverse movements in real exchange rates, the developers would be allowed to draw from the liquidity facility to service the debt. The amount withdrawn from the facility would be indicated as a subordinated loan to the project’s senior lenders in the books of the borrower and would be repaid whenever the project generates surplus cash; resembling a revolving credit facility. The exchange rate liquidity facility would likely encourage project developers to opt for foreign loans as it provides a cheaper currency hedge option compared to the existing market instruments. The cost of the liquidity facility would likely include a commitment fee of around 0.85% per year – plus an interest on the amount withdrawn from the facility. However, it is difficult to estimate the cost that the interest rate would add to the total cost of debt in general as the interest rate charged would depend on the size and duration of withdrawal. The cost savings for a project developer would be equivalent to the cost of currency hedge (7%) minus the cost of the liquidity facility to the developer plus the inflation differential. At an assumed commitment fee of 0.85%, compared to the baseline foreign debt cost of 13%, the liquidity facility can reduce the cost of debt by up to 1.4 percentage points, assuming that there were no withdrawals from the facility. Any withdrawals would attract additional interest rate cost, which would lower the overall benefit. Although foreign loans could be extended up to 18 years, the lack of currency hedging instruments for such long durations limits the tenors to 10 years. The exchange rate liquidity facility would help to extend the tenor of foreign loans up to 18 years. Reducing the cost of debt by 1.4 percentage points and increasing the tenor by 8 years would decrease the delivered cost of renewable energy by approximately 11.2%. If the Indian government plans to introduce this facility for renewable power projects in India, it needs to address some of the existing hurdles that restrict the use of this facility. We recommend further work to examine the foreign exchange liquidity facility in more detail to identify a design that is suitable for Indian conditions. We also recommend analysis on specific issues such as the size of the liquidity facility and design of tariff. An IDF-MF functions like a typical mutual fund, which issues units to raise money and invests the proceeds in debt for companies and projects, with an exclusive focus on the infrastructure sector. An IDF-MF diversifies the risk of investing in infrastructure since the units derive their value from a pooling of cash flows. Some of the instruments, such as the infrastructure debt funds and partial credit guarantees, have been recently introduced in India, while some others haven’t been used in the country yet. The purview of a few other instruments needs to be expanded to cover renewable energy projects. Further, a single instrument alone cannot solve the problems in debt financing for renewable projects. In addition, private players may find it difficult to introduce concessional financing instruments due to various structural issues. The government should therefore prepare the groundwork to introduce a set of instruments that can, together, effectively reduce the cost of debt in a way that also encourages private investment. Among the instruments, a direct government borrowing and lending program would likely have the maximum impact of reducing the cost of delivered (or levelised) cost of renewable energy by approximately 25% compared to the applicable baseline. While the benefits are substantial, the government should design this program with checks and balances to avoid crowding out of private investment. Significant impact could also be achieved through the use of other instruments recommended such as the infrastructure debt funds (mutual funds), partial credit and risk guarantees, and exchange rate liquidity facility; which have the potential of reducing the delivered cost of renewable energy in the range of 10.5-14.5% as indicated in the table below. The government could reduce the cost of debt further by extending an explicit subsidy through these instruments. Morgan Stanley (2012), Proposal to share hedge costs between the government and private players. Consultant with CPI’s India office, where he supports The India Innovation Lab for Green Finance.